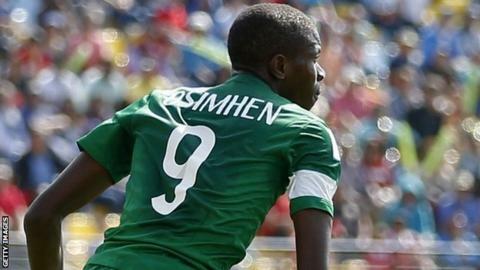 Victor Osimhen, top scorer at the Under-17 World Cup, has been included in Nigeria's squad for the Under-23 Africa Cup of Nations in Senegal. After scoring 10 goals to help Nigeria win the trophy last month he had been on standby for the tournament which is also a qualifier for the Rio Olympics. Osimhen was drafted in to replace Isaac Success, who has not been released by his Spanish club side Granada. The finals take place from 28 November to 12 December. Matches will be played in Dakar and M'bour, and the top three teams will also earn a spot at next year's Olympics. Coach Samson Siasia has named three foreign-based players in his 21-man squad, including Taiwo Awoniyi, who is on loan from Liverpool to German side FSV Frankfurt. Twelve players from the squad that won a bronze medal at this year's All African Games in Congo-Brazzaville, including Erhun Obanor, Kingsley Sokari, Etor Daniel and Mustapha Abdullahi, have been omitted. However, the so-called 'Dream Team V' led by Austin Eguavoen failed to qualify for the 2012 London Olympics after crashing out in the group stages of the qualifying tournament in Morocco.